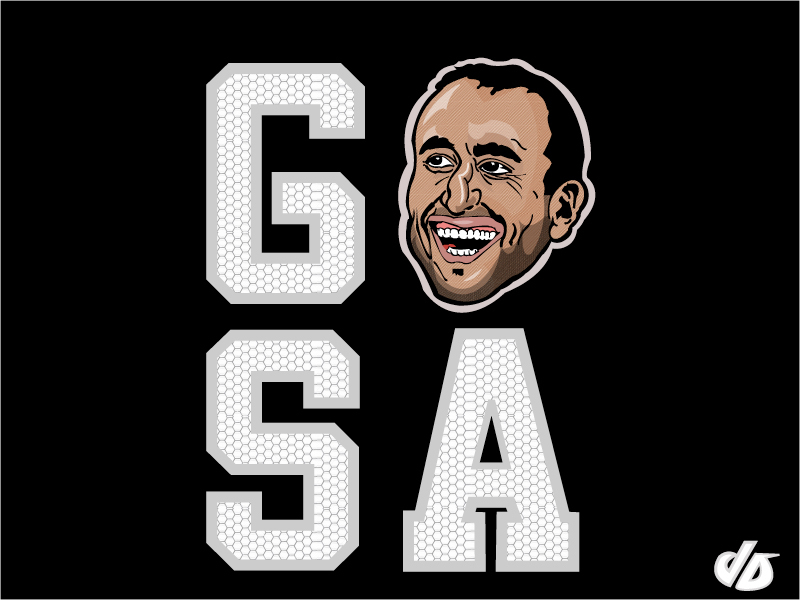 MANU GINOBILI SAN ANTONIO SPURS ART! Hey everyone back to http://www.joedichiara.com with a new addition to my “Go NBA” series. This week’s illustration is of the San Antonio Spurs’ shooting guard Manu Ginobili. Ginobili is one of the NBA’s greatest European League players originating from Argentina. He has had a very impressive career as both an American professional and Argentine national member. Manu has been apart of 3 NBA Championship teams and won a gold medal as a member of the 2004 Argentine Olympic team. He is one of only two players, along with Bill Bradley, to have won a Euroleague title, an NBA championship, and an Olympic gold meda. Be sure to check back this week to http://www.joedichiara.com to view the next illustration in this series. Here is a video mix of Ginobili’s career highlights. Argentina isn’t in Europe man. Thanks for the comment Scott, but I never said Argentina is in Europe it’s in South America. I was referring to Ginobili’s career in Europe as a member of the Italian club Virtus Pallacanestro Bologna, where with Kinder Bologna, he helped win the 2001 Italian Championship, the 2001 and 2002 Italian Cups, and the 2001 Euroleague, and he was named the Euroleague 2000–01, Euroleague Final Four MVP. He was also named the Italian League MVP in 2000–01 and 2001–02, and made the Italian league’s All-Star game three times during this period.